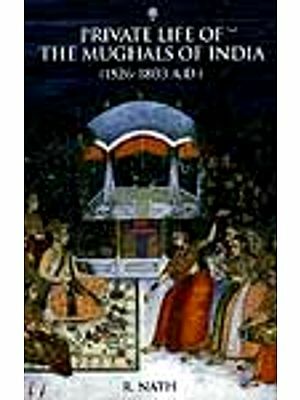 Though with a blend of different images born of as many contexts, the painting, a rare masterpiece rendered in the Provincial Mughal style as it was practised around the late eighteenth century at Mughals’ provincial headquarters like Oudh sharing some of the European art elements, portrays Mughal Emperor Shahjahan with sick Mumtaj Mahal, his most beloved wife to cherish whose memory he built one of the world’s most beautiful monuments the Taj Mahal. As is often contended, before she passed away Mumtaj Mahal desired that Shahjahan built for immortalizing their love a monument with rare beauty, and the Taj Mahal was its result. Maybe, the painting illustrates this legendary moment. 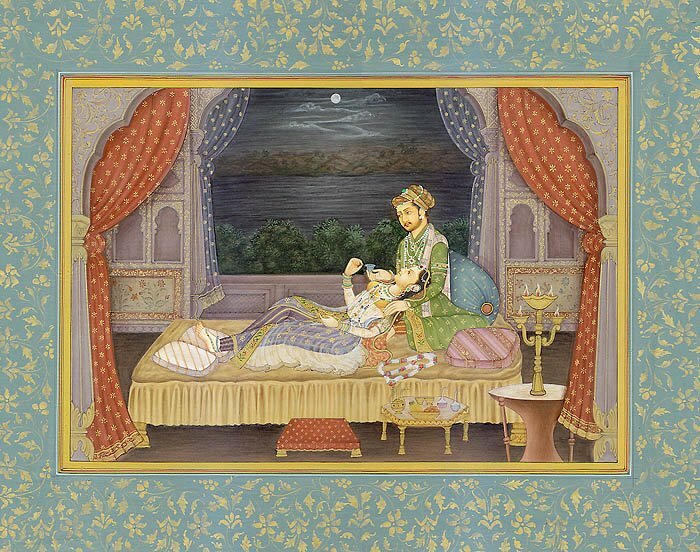 Richly costumed and lavishly bejeweled Emperor Shahjahan is seated squatting on the bed against a large bolster cradling his beloved wife’s head on his lap. The world beyond the palatial window : a moon in the sky peeping from behind the clouds, distant hills, a large river and a column of dense forest, abounds in rare romance; however, it fails to find its reflection on the Emperor’s face despite that he has with him, in his very lap, his most beautiful and beloved partner. The artist has wondrously discovered in the midst of his grandeur shades of anxiety on the Emperor’s face and in his demeanour. The fear of something untoward, and a feeling that with all his imperial power he can not counter it, seems to lurk in the corners of his eye. Exhausted and tired-looking Mumtaj Mahal, with her head and body’s upper part supported on the lap of her spouse, is lying on her bed. Grown weak, as becomes evident from the dark areas around her eyes and her pale face with its entire glow lost, she is unable to even fully stretch her figure and has her both legs raised, right in full, and left, partially. While patting her shoulder with one of his hands the Emperor seems to boost his beloved wife’s morale, with the other, carrying a jade goblet with some medicine in it to administer it to her, he is emboldening himself to fight out all that is acting against her. 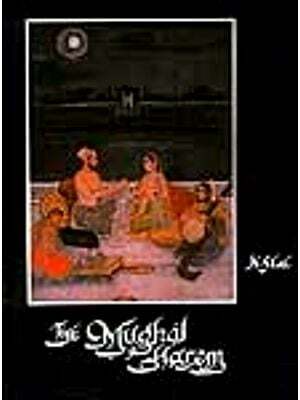 The artist has dramatised his theme : Mumtaj Mahal lying on a sick bed and her loving spouse Emperor Shahjahan attending upon her and administering her medicine, by incorporating into it the image of Musamman Burj, a marble tower in Red Fort at Agra, overlooking the river Yamuna and the Taj Mahal on the river’s other bank. Rare in its beauty and the most beautiful part of the Agra Fort often described as a fairy bower hanging over the rugged rampart of the Fort, Musamman Burj was built by Shahjahan himself after he was enthroned as the ‘Patshah of Hindustan’. Unfortunately, during his last years when his son Aurangzeb had imprisoned him, he was kept in the Musamman Burj itself. Mumtaj Mahal had passed away at Burhanpur, in Central India, where she was accompanying her husband during a military action against some rebels in 1631, not at Agra. However, being so significant in Shahjahan’s life, the artist chose to place his last moments with his beloved wife Mumtaj Mahal with Musamman Burj as their venue, not a battlefield or a military camp.